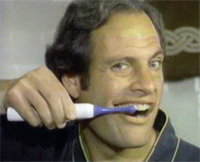 Before he became “The King of Infomercials” Ron Popeil was already well know for selling his Ronco gadgets on short form TV commercials. 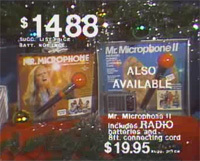 The website for the Biography channel features dozens of these classic 1970s Ronco commercials, including spots for Mr. Microphone, Mince-O-Matic, Mr. Dentist, Smokeless Ashtray, Pocket Fisherman, and many more. I only remember the Mr. Mircophone and Mr. Dentist ads first hand, but watching these commercials will take anyone back to the era of disco, leisure suits, and hyperinflation. Can there really be anything more 1970s than roller skating in hot pants while using a Mr. Microphone? I remember the smokeless ashtray. I also remember someone using it. The only thing i used that was ronco was the rotisserie grill. It was hard getting the food out when it was done, and even harder to clean the inside. Made noise when it was rotating too.